Silsila Badalte Rishton Ka is one of the most loving TV serials. Silsila Badalte Rishton Ka colloquially known as Relationships. Silsila Badalte Rishton Ka is a 2018 Indian Hindi television drama series, which premiered on 4 June 2018 on Colors TV. The show is all about the childhood friends Nandini and Mauli who gets separated and after seven years they met. Silsila Badalte Rishton Ka is currently attracting more and more viewers. There is a high- voltage drama is going on in the serial. There is so much drama is going on in the Silsila Badalte Rishton Ka. The serial is giving so much entertaining to their audiences for a long time and getting an overwhelming response from the audience. Today’s episode of Silsila Badalte Rishton Ka- Pari disturbed after Mishti’s Behavior. Silsila Badalte Rishton Ka 4th December 2018 written episode update begins with Pari was crying while Kunal comforts her. Pari said that she is a bad unlucky girl. She thinks that firstly god snatches her mama and now Mishti as well. Kunal wipes her tears and hugs her assuring she is the best girl in the whole world. Pari said that Mauli aunty and Mishti must have loved her if she was a good girl. Kunal asks if she loves him. Kunal asks earlier as well, they were very happy and now they will live happily in future. He gets a call from Ishaan. Ishaan holds Mauli’s hand in the restaurant. Kunal said that this means Mishti Knows the truth, he wonders what to say, he gets confused. Both her daughters have to suffer a lot of problems because of him, he feels very guilty. Mauli said she never wanted Mishti to know the truth, not this way at least. Ishaan suggested that the three of them must sit together. Kunal requests Mauli not to misunderstand him, but may he knows what she told MIshti about their past: maybe, unknowingly Mauli said something that made Mishti hate him. 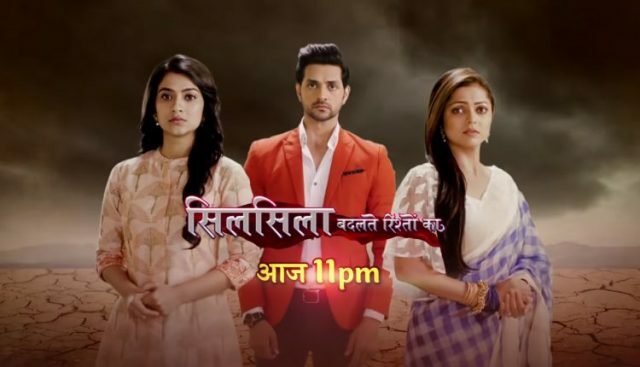 Upcoming TV serial Silsila Badalte Rishton Ka 5th December 2018: Kunal finds Mauli’s dress caught fire working in the kitchen. He rushes to put it off and help Mauli. Previous articleKulfi Kumar Bajewala 4th December 2018 Written Episode Update: Is Kulfi Is The Daughter OF Tevar? Next articleSquads name of team india, India vs Australia 1st test match. who will be win tomorrow.